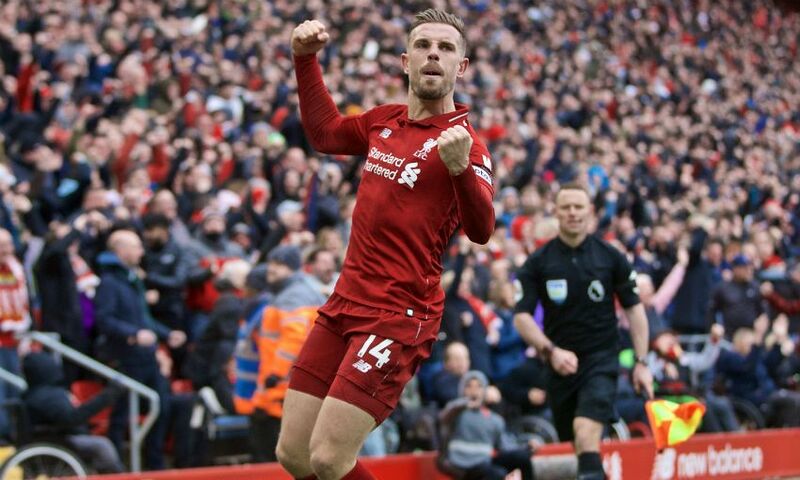 Jordan Henderson stressed Liverpool need to keep putting in the hard yards and believing anything is possible as attention now turns towards the Champions League. The Reds returned to the top of the Premier League with a patient 2-0 victory over Chelsea at Anfield on Sunday. But thoughts on the remaining four matches of the top-flight season must be put aside quickly, with Jürgen Klopp's team in action on Wednesday for the second leg of their Champions League quarter-final with FC Porto. Henderson told Liverpoolfc.com: "It was a big game, we knew that. Chelsea are a good side, a tough game - as we've known from the last few years. It's a really good performance. "We've got to keep believing in the games that we're in. We keep doing the good things that we've been doing, keep working hard and then win as many games as we can. That's our focus." The captain added: "[It was a] brilliant day overall - two great goals, a clean sheet, a top performance really. We're delighted. "But we can't think about it too much because we've got a game in a few days, so we've got to recover well and focus on that. [It's] another big game for us - a tough one. We've been there before and played well and got the result. "But it might be different because they're a good team, [and there will be] a great atmosphere. But for us again it's about going there, performing and getting the result we need to get to the next round." For the third match in a row, Henderson operated in a more advanced midfield role and had a crucial impact on a goal scored by the Reds. His performance versus Chelsea was fully in line with the manager's demands of a midfielder as he quickly pounced on a loose ball before crossing for Sadio Mane to head in and make it 1-0. "I think someone got tackled so I was thinking about counter-pressing in the box to win it back quickly," Henderson explained. "I managed to get there first and then when I was at the byline, I just managed to dink it at the back stick where Sadio was waiting thankfully. "That was an important goal. But the second goal was an amazing strike by Mo [Salah], so I'm delighted for him as well."